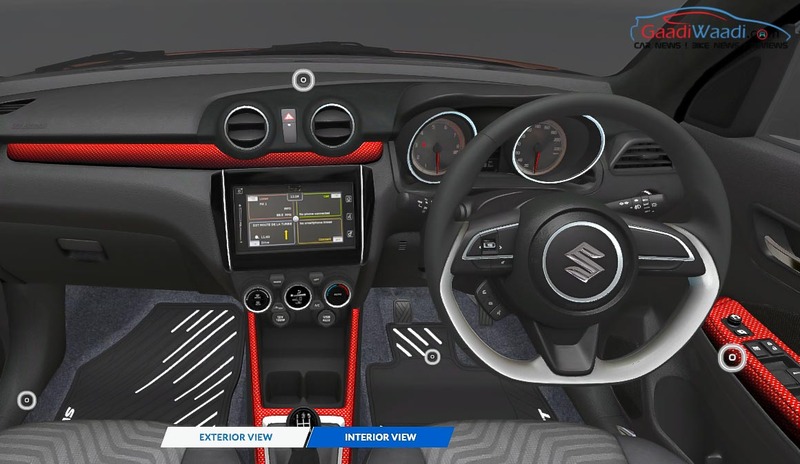 Maruti Suzuki India Limited (MSIL) took the show floor at 2018 Auto Expo to not only launch the new generation Swift hatchback but display the iCreate customisation kits to give prospective customers a complete preview. The iCreate personalisation is available across several models within the brand’s portfolio as well. 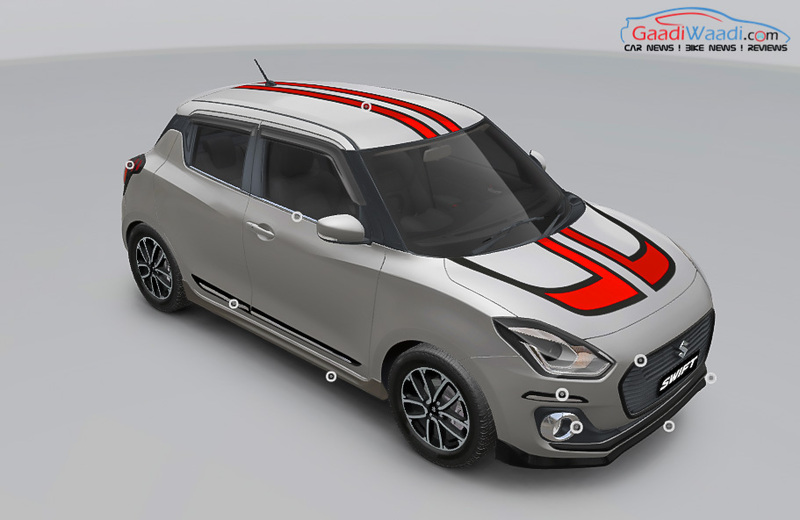 The 2018 Swift can be personally customised using the official configurator of Maruti Suzuki and it gives an in-depth virtual look into how the factory mods will turn out in the real world. 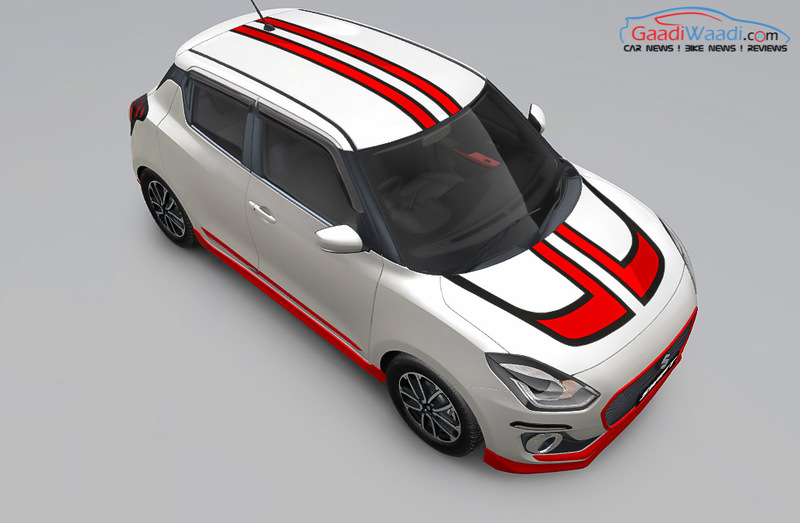 The largest automaker in the country is offering many accessory kit options with the Swift hatchback and buyers can choose their individual preference or choose a particular package. 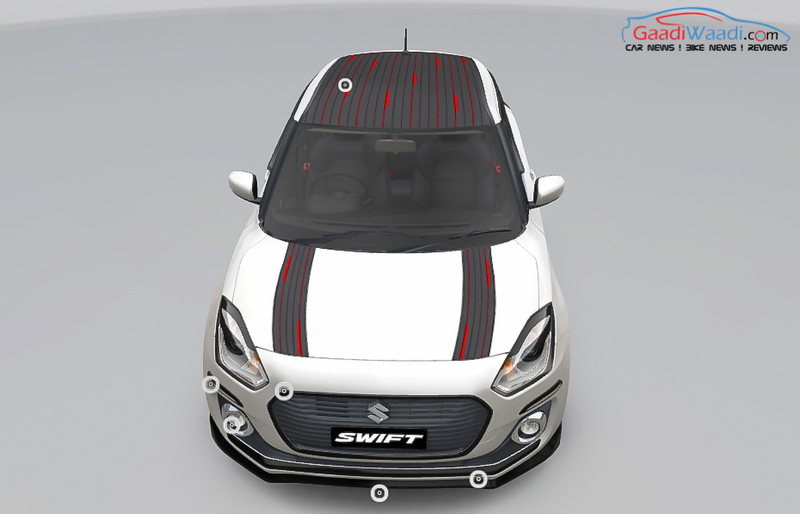 The styling kit is the most expensive of them all as it comprises of custom graphics on the roof and bonnet with various designs and what we have showed here is one example of how the Swift can be configured out of the regular white paint scheme. 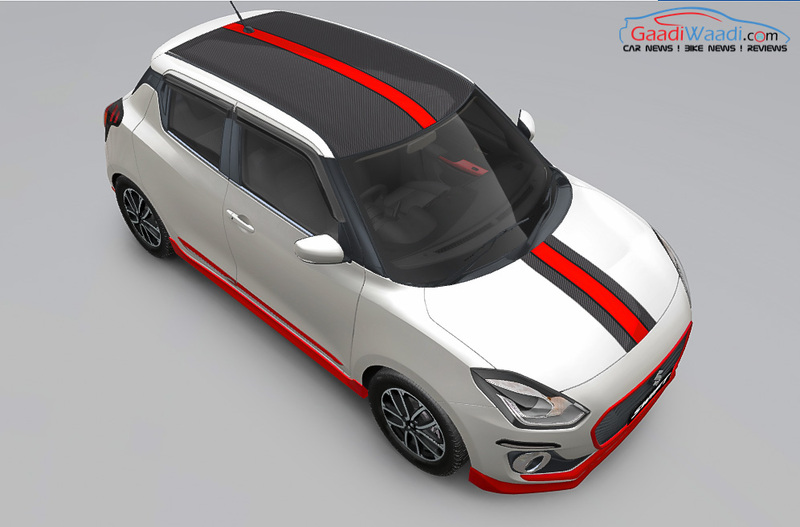 For the exterior, the accessories provided are door visor, for lamp garnish, tail lamp garnish, carbon bolt roof wrap, bumper corner protector, etc. They help in substantially making the sporty hatchback stand out among the crowd of affordable hatchbacks. Just as in the case of the exterior, the cabin can also be enhanced using accessories like designer mat, styling kit, flocking kit and illuminated door sill guard. The wide range of custom kits do bring an unique composition to your regular Swift. 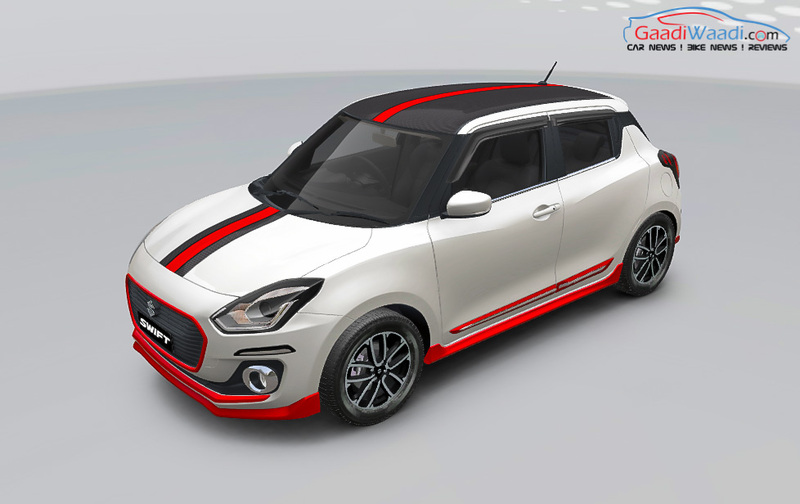 The third generation Maruti Suzuki Swift achieved instant prominence and in just 145 days of its market entry more than one lakh units were sold – fastest ever car to attain that milestone. 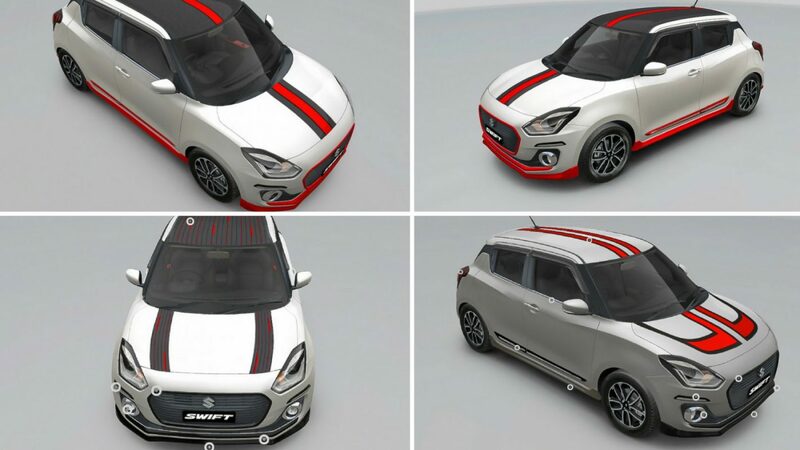 The Swift garnered nearly 23,000 monthly unit sales in more occasions than one during the course of this year. 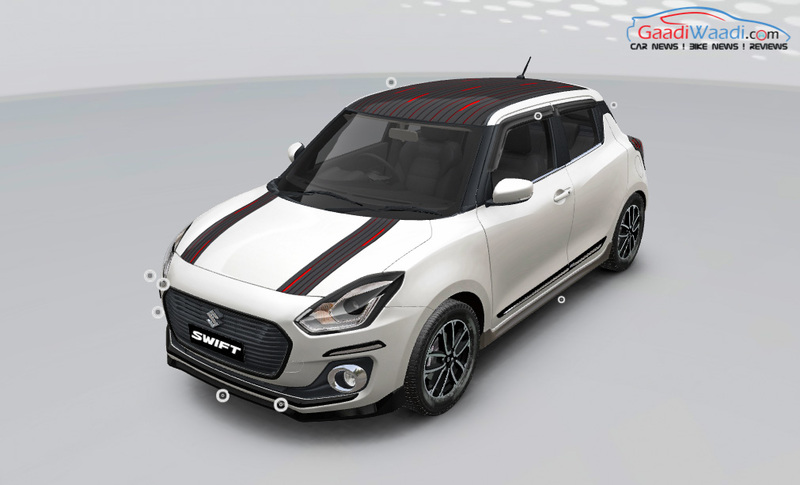 The latest Swift is based on the fifth-generation Heartect platform and comes loaded with several upmarket features including touchscreen infotainment system with Apple CarPlay and Android Auto connectivity. With thorough overhaul to the exterior and interior, the hatchback has indeed set a new benchmark in its segment.